Our Mexican neighbors gave us a lot more than good food and the piñata. In fact, many everyday English words have their origins in Spanish. 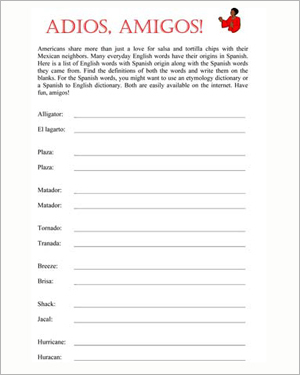 This Cinco de Mayo activity teaches kids about English words that came from the Spanish language, also teaching them a few Spanish words in the process. Have fun, amigos!